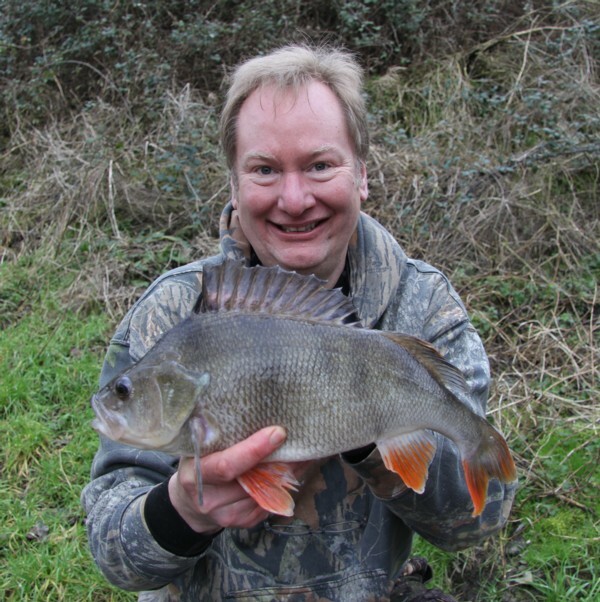 Back on the river roach fishing after 5 years and a good roach and Paul gets a big perch too. It seems to me that every three days we have a low weather front coming from the Atlantic and dumping torrents of rain in south England. Once the river levels start to drop another low arrives to top things up again. This has been going on for about 6 weeks now. The H.Avon and D.Stour have been over their banks several times with the Stour reaching a new record high over Christmas. So it’s been fishing for perch and an odd session on the Bristol Avon for roach. It was while I went to look around the Cotswold water park for an afternoon that I looked at the upper Bristol Avon and decided it was just the right height and colour for the roach. However I had not fished this stretch in over 5 years. So a quick phone call to my mate Ivor had us meeting up to fish the place. 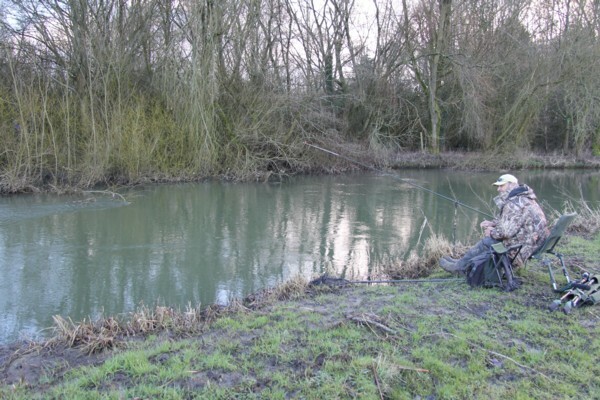 The river is deep here in places 12ft at most and also has some shallower water of 6ft or so. A few roach had been coming out to 1.5lbs so there might be a chance of a good one. The cormorants had taken their toll on the roach over the last few years so my hopes were not that high. I met with Ivor at 1.30pm and we walked the stretch and I decided to fish a slackish area next to a feed bed of about 6ft deep. I was using two rods one with a feeder and maggots. The other a cage feeder with liquidised bread and flake on the hook. Well the very first cast at 2pm saw the flake rod tip tremble and then arch over. The strike was met with a good fish on the end. Like all good roach it came to the surface quickly and I could see it was over 1lb, so what a start. 1lb 3oz beauty. So Ivor took the photo for me and we slipped the roach back a little way downstream. Next cast saw the maggot rod tip tremble and again like a coiled spring I was on the rod and landed a nice dace of about 4oz. Well this was very good and even better when the next cast resulted in a nice little brown trout of about 10oz. It’s nice to be back I said to Ivor. That was the kiss of death as the afternoon wore on nothing much came along other than a minnow for me. 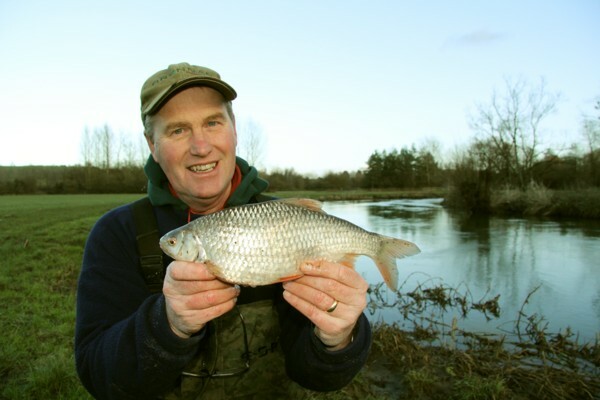 Ivor moved down close to me and was fishing a lovely looking swim with plenty of cover for the roach on the far bank. The only problem with this stretch of river is that about 200m downstream there is a weir and sluice that the owner keeps open whenever there is a hint of rain and this leads to the water flow increasing even in 12ft depth. Ivor fishing a really fishy looking swim. Well darkness was starting to descend when the tip rattled again on the flake rod and I hooked a nice little roach of about 4oz. We stayed for a little longer for nothing much else, other than a minnow for Ivor. I might just look back here again later in the next 6 weeks certainly before the end of the season. Now I had another session with Paul fishing for perch. He had seen that I’ve been catching a few good perch of late and he wanted to beat his Pb which stood at 1lb 15oz. Now the venue I’ve been fishing does contain a few 2lbers and with a little bit of luck he would be OK and beat his pb. He couldn’t get there too early as he needed to get young Alex off to school and then had to drive the 1.5 hrs to the venue. He arrived at about 11am and soon found me. I had already caught 5 perch including a 1lb 14oz and 1lb 15oz so at least they were on the prowl. He took my place in the swim and soon he was casting out the prawn bait and spraying with maggots. The smaller roach and fry were boiling in the swim every time maggots were introduced which would get the perch on the feed. First perch for Paul was a small 1lb fish. Then I didn’t note down the times as I moved to another part of the lake. What I do know is Paul gave me a shout at about 2.55pm to say he thought he had his first 2lb perch. So camera in hand I went up and saw a really great looking perch in his landing net. Soon it was unhooked and weighed. Bingo 2lbs 13oz perch and a new pb for him. He had 5 more perch I think the largest went 1lb 14oz, 1lb 15oz and another at 2lbs, so in total we caught 12 perch on the day from that swim excellent and “red letter day for him”. It’s always great when someone beats their pb and to do it by almost 50% is perfect. Paul that 3lber will I’m sure be just around the corner. This entry was posted on Sunday, February 2nd, 2014 at 6:56 pm	and is filed under Uncategorized. You can follow any responses to this entry through the RSS 2.0 feed. Both comments and pings are currently closed.